I’ve tried many fruit bar recipes over the years and they’re all good. However, the recipes I return to are the easiest to assemble. This is a perfect recipe for yummy snack bars because the bottom crust and the top crumble are the same. There’s no need to get out another bowl and mix up a separate topping. 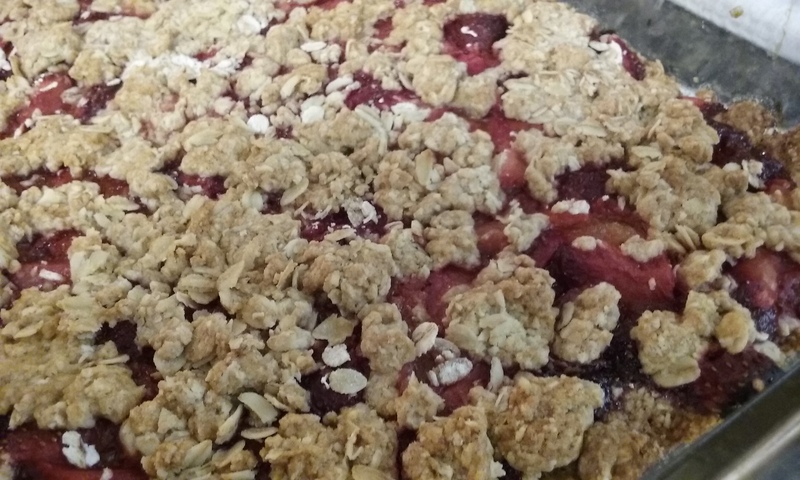 This particular recipe also makes the filling quick and simple by using fruit jam mixed with fresh or frozen fruit. It gets bonus points for using rolled oats, which means it’s totally fine to have for breakfast. You can make these bars with any fruit and jam or preserves that you have on hand. I had strawberries in the freezer and a fresh meyer lemon, so I used those. I used a rectangular pan and the bars were too thin. Use a square pan for thicker, sturdier bars. I really love the toasty, buttery crust and the zing of the lemon with strawberries. This recipe is easy and satisfying. zest of one lemon, lime, or orange – optional but yummy! 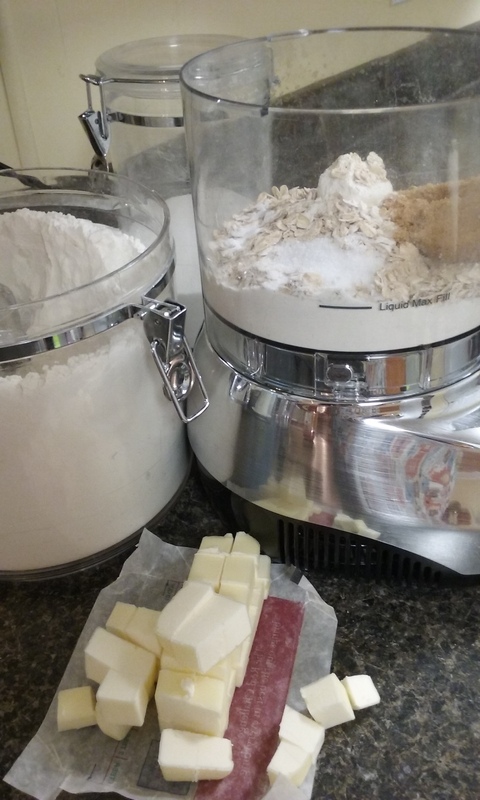 Place the dry ingredients in food processor and pulse a few times to combine. Add butter and pulse about 10 times. Add the cold water and lemon zest and pulse to combine. Take the top off the food processor and check your progress. 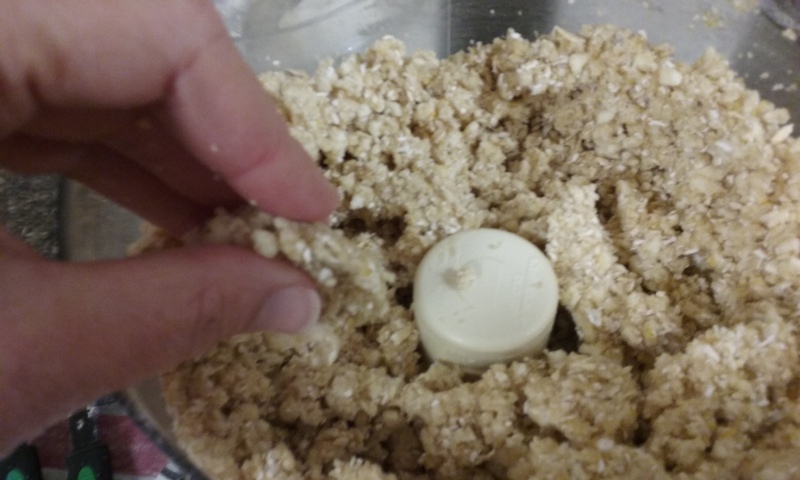 The dough should be crumbly but hold together when pinched. Add more cold water if needed. Press a little more than half this dough in to a square pan and bake for about 12 minutes. Add 1/4 cup rolled oats to the remaining dough mixture and save for the topping. Take the pan out of the oven and spread the jam on top, then the fruit and sprinkle the lemon juice all over. You could mix this stuff up in a separate bowl first, but why bother? Crumble the remaining crust mixture on top and bake until golden brown and bubbly, about 20 minutes. Let cool before attempting to slice. This entry was posted in bars. Bookmark the permalink. Fruit bars sounds good will have to try them.